If you are suffering from pain in your neck, lower back, pelvis or extremities, you can be pain free and experience a full range of motion instantly! And you can enjoy this new found relief without drugs, surgery, supplements, or painful needles! This is the most powerful of all the classes I've taken, especially for my own body. Five days after the class, I had a terrific detox. My husband says that this has had more effect on my scoliosis than anything else that I've done. I was so impressed by what they gave me in class, and already the results that I have had are pretty impressive. 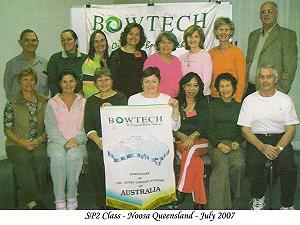 As I attended the last Bowen Academy course for Specialised Bowen Procedures 2, I looked back over the years to 1987 when I did the Bowen Technique Diploma course. Before the modules were put in place, you taught me the R.S.J moves, the foot flex (ankle) the gall/liver (with the resp), the T.FL., the additional resp moves and Teres Major too. Then ten years ago I asked you about cardiac and eye procedures and you showed me the moves for those. All of the above I have later learned at the courses of Specialised Bowen 1 & 2. Time sure gives perspective! I see now, how you learned early in the teaching process the wisdom of compartmentalizing the Bowen moves into bite sized modules for us to digest, apply and experience, before moving us onto further moves and deeper concepts. Thank you for being diligent stewards of the gift. As I review my notes from 1987 to now, I begin to see the process you committed yourselves to, as you laid down your lives to honour your promise to Tom Bowen to bring this gift to the world. Thank you, for your faith and endurance, your humility and vision; the teamwork, skill, wisdom and integrity you lead with is an enduring inspiration to all who are privileged to know you. - Kim Lim-Owen, Pacific Paradise, Qld. 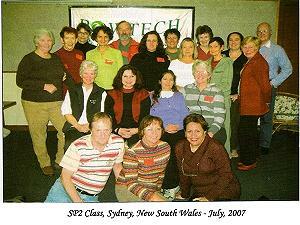 I had the privilege of recently completing the Master Class 2 with Ossie and Elaine in Sydney. After having the pleasure of being a Bowen Therapist for a number of years it is wonderful to have new tricks up my sleeve which address areas previously not covered. So far I have used the Shoulder releases, particularly the Infraspinatus Move, the Prone Sacral and the 'new' Pregnancy Moves with great success. The active Hamstring Procedure, whilst needing much "audience participation' worked a miracle for a hockey player with a persistent and painful hamstring injury. So, thank you so much, Ossie and Elaine, for expanding my repertoire. I would like to tell you how amazing some of the work that has been shown to us by Ossie and Elaine at the Masters Class really is! The new moves I learned in the Master Class have added more to my expertise, especially with the pelvic and shoulder procedures. The extra sinus moves have been very beneficial especially to myself. Thank you for your inspiration and encouragement. In a million years I could not thank you enough for bringing Mr. Bowen's genius to the world. I shudder to think what my life would have been like if Bowenwork had not come to me. And so, the ripple continues - now I cannot imagine what life would be like for my family without Bowenwork. Within my community of clients there has been an outrageous success - much suffering from the small problems to the very large problems has been relieved. This is just my small world. When I think of the impact the two of you have had on this planet - that will continue for generations to come - I am truly in awe, and truly humbled. I know it has been of great personal loss to both of you. My prayer is that your happiness and joy match the good you both have brought to this world. You are angels in human form. The Bowenwork.com website directed a lady who lives 50 miles from here to contact me, and this past Saturday I worked an outcall for 6 people in "field" conditions (1 table and 2 kiddie mattresses on the floor in an upscale day care center); gave brms and kidney and rhomboids to a young woman six months pregnant. Her baby (6 month old fetus) was laying cross-wise, head to right of navel, feet to left of the mom's navel. During the session she switched sides, as she couldn't lie prone or supine. I was up and down doing my best with three simultaneous clients. Following the session, she arose and the baby had turned head down, which she was hoping her child would do at some point. Wow! Her mom and sister were a buzz talking about how she looked differently than before the session, and her younger sister remarked "My neck feels better" after she finished. I am reminded of something Elaine once said in training: providing Bowen gives these little bubs a fighting chance. Thankfully, Ossie and Elaine and Tom Bowen have made this possible, and I am ever grateful for such a blessing." NOTE: This woman found David's listing on Bowenwork.com. All active Professional Bowenwork Practitioners who are current with their registration renewal fee, CPR certificate and continuing education hours are listed on this website.